The notion of creativity fascinates me: What is creativity? How do we find it, keep it, tap into it, hone it, and nurture it? How could we possibly hope to define or shape that spark of impulse that flows through us all in one way or another? I don’t think this book answers any of those questions, not really, but it does encourage me to keep asking myself them, and that’s a noble thing. Sometimes you are waiting for a book to come into your life, but you just aren’t sure what it is. 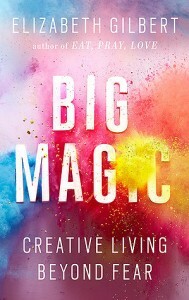 Big Magic was that book for me. It arrived when I was feeling exhausted and uninspired. I knew all the right things to say to myself, indeed I don’t think there was a single section of this book that was in any way a revelation for me, but I needed an extra kick to rekindle my curiosity. And there was Big Magic. Ever since I was aware of the joy that being creative brought me I have been afraid of it. What if this drawing is the best one that I ever do and I can never do another? What if this painting, this play, this dance, this ceramic piece, this quilt, this wooden monstrosity, this cake, this photo… what if what if what if…? But, as you may have guessed from this list, I have managed to express my creativity in lots of different ways over the years. My curiosity about making things, trying things, learning things has always exceeded my fear that my creativity will somehow all be used up. This notion fits perfectly with the idea that Gilbert explores in Big Magic: Creative living beyond fear. The book is broken up into a series of sections: Courage, Enchantment, Permission, Persistence, Trust, & Divinity. And each one is filled with reassuring words and anecdotes about Gilbert’s experiences as a writer and the experiences of people she has met or researched. Now, Gilbert is not an expert. She is not a researcher like her friend Brene Brown (whose writing about shame is brilliant and the result of many years of quantifiable research). This book is not unique, and does not contain any ground-breaking, earth shattering revelations. In fact, I made a note to myself early on in my reading that ‘much of this content would be obvious to anyone with more self-awareness than a pine cone’, and I stand by that statement. Despite all this I really enjoyed Big Magic, it was light hearted and accessible. Sure Gilbert labours a few points, and her spiritual notions of creativity as some kind of ‘force’ is not at all compatible with how I understand it. But I don’t think that matters, it certainly didn’t impact my enjoyment, and it reminded me gently of all the questions that I know I should ask myself but sometimes lose sight of. And sometimes we all need some reassurance that we are on the right path, that we are not alone, it’s ok to be afraid, to make bad choices, or to fail. There are lots of places that we can find that reassurance, and for me books happen to be one of them.